My son is a bit too young for printable travel games so when we travel with him we load up with things like coloring pages, stickers, magnets in a little tin box and of course iPad games. He’s almost 3 years old so keeping him sitting for long car rides and flights can sometimes be an issue. If your kids are a little bit older, we have quite a few free printable travel games that can help keep them occupied for long trips or while waiting in an airport. 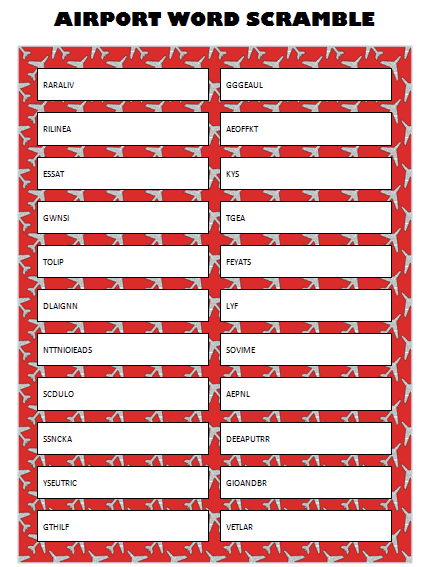 The freebie we have to share for you here is an Airport Word Scramble Game. This game is quite easy to play but the scrambled words may be a bit tricky to figure out so I’ve included the answers on the bottom of the printable airport word scramble game. You can fold this piece over so the kids can’t see it while trying to solve the puzzle. You could also use this game as part of a party favor for an airplane-themed birthday party. To play the game, you simply use the letters in each white square to unscramble to make a word related to the airport or air travel. The answers are: Arrival, Luggage, Airline, Takeoff, Seats, Sky, Wings, Gate, Pilot, Safety, Landing, Fly, Destination, Movies, Clouds, Plane, Snacks, Departure, Security, Boarding, Flight, Travel. Looking for more printable travel games? Yes, we have more! Airport Window Scavenger Hunt – While staring out the window of the airport waiting for your next flight, here is a fun printable game of scavenger hunt items you can look for through the window. Airport BINGO – How many of these items can you find while walking through the airport? Airport Word Search – A quiet game to play either on or off the airplane. This would be a lot of fun and a good way to keep the kids entertained.